This course has been developed in consultation with the Peacekeeping Best Practices Section of the UN Department of Peacekeeping Operations’ Policy, Evaluation and Training Division. It is based on the internal DPKO/DFS publication entitled United Nations Peacekeeping Operations: Principles and Guidelines, which is more widely known under its informal name Capstone Doctrine. This publication is a comprehensive document that defines and promulgates available peacekeeping doctrine, definitions, procedures, and policy. In ten chapters, it introduces the concept and evolution of UN Peacekeeping, explains the decision process that precedes the deployment of a peacekeeping operation, and then the planning process to implement that decision. It also discusses the art of successful mandate implementation and addresses the management of peacekeeping operations, how operations are supported and sustained, and how they are concluded at their termination. The Institute course Principles and Guidelines is designed to teach this DPKO doctrine to all UN personnel serving in the field and at Headquarters, as well as to those who are new to UN peacekeeping. Ten chapters. Ce cours a été développé en consultation avec la Section des pratiques optimales de maintien de la paix de la Division des politiques, de l’évaluation et de la formation du Département des opérations de maintien de la paix de l'ONU. Il est basé sur la publication interne du DOMP/DAM intitulée Les Opérations de Maintien de la Paix des Nations Unies: Principes et Orientations, qui est plus largement connu sous son nom informel de Doctrine Capstone. Cette publication est un document exhaustif qui définit et promulgue les doctrines, définitions, procédures et politiques disponibles sur le maintien de la paix. En dix chapitres, elle introduit le concept et l'évolution du maintien de la paix des Nations Unies, elle explique le processus de décision qui précède le déploiement d'une opération de maintien de la paix et ensuite le processus de planification pour mettre en œuvre cette décision. Elle traite également de l'art de la mise en œuvre réussie de mandat et traite de la gestion des opérations de maintien de la paix, de comment les opérations sont prises en charge et soutenues, et de comment elles sont bouclées à leurs fins. Le cours Principes et Orientations de l'Institut est conçu pour enseigner cette doctrine du DOMP à tout le personnel des Nations Unies servant sur le terrain et au siège, ainsi qu'à ceux qui sont nouveaux dans le maintien de la paix de l’ONU. Dix chapitres. "the course is preparing me for the feature use "
"useful course and well done, good info., very complex exam - useful for military personnel. Thank you!" "ECELLENT course, free of cost, knowledgeable....... "
"Very Educative.. Achieved a lot during the course duration." "The course is well researched, detailed and offers a practical approach to all Components serving in a UN Mission area." "the course is informative,educative and systematic which gives depth knowledge of basic principal and functioning of UN "
"The course contains Procedures and orientations about peacekeeping operations. Very useful for futures candidates." "the course is very help full"
"The course is realistic and to the point and it discussess the operational issues as they are on the ground. " "Les détails sur les principes et orientations des opérations de maintien de la paix des Nations Unies sur la Mission elle-même, c'est à dire le processus de démarrage d'une mission (SOFA/SOMA), le pré-déploiement, le déploiement, ainsi que les principes et les règles fondamentaux du droit international humanitaire." "Its a very educative and informative write-up. It has broaden my knowledge and am better informed mire about what is expected in all UN departments at large." "I really liked the flexibility of this course. It worked well with busy scheduling, and the expectations were clear and upfront." "Very fruitful learning as it affords me the opportunity to learn a lot." "it's a very complete and interesting course"
"le cours est tres interressant "
"It gives a clear and broader percipective of peace keeping operations"
"interesting and important in my fuyure endevors "
"the topic is very essential for peacekeeping"
"Sa methode, sa coherence et son style de resumee"
"A very good course to introduce you to UN Peacekeeping Operations"
"The course enable to explore experiences of the peacekeeping missions. The information was resourceful and hence will apply the knowledge attained productively"
"it is very good for us"
"The details on the knowledge of the Security Council and International Humanitarian Law." "toutes les informations de l'histoire et des principes internes des Nations Unies"
"The course is a mind opener. It will bring great opportunities in my career"
"This is great. I really enjoyed it. Thanks"
"Thank you for this online course"
"It was an amazing course with valuable information about UN System. " "The UN should massively engaged in preventive missions to react appropriately to the horrendous effects of both natural and man-made disasters including wars." "i have studied many useful principles in favor of United Nations peacekeeping operations in countries where violence and war are frequent"
"You’re very educational material an excellent source of knowledge"
"A comprehensive course which gives students a clear view over the complexity of peacekeeping operations." "THE COURSE IS VERY INTERESTING AS IT OFFER THE VAST KNOWLEDGE IN PEACEKEEPING. " "THE COURSE IS VERY USEFUL,EDUCATIVE AND INSPIRING." "what I like about the course are those principles and guidelines to obeyed and followed during peacekeeping operations." "Ce cours contient un maximum d'informations relatif au maintien de la paix. Il serait encore plus intéressant s'il y avait des cas pratique. " "this course was so interesting as it explicitely explained detailly the peacekeeping operation concept of the United Nation, the Human rights concept, International Human Rights concepts with its various applications. 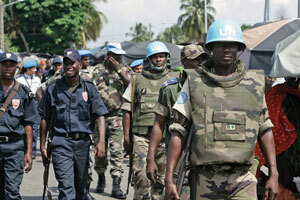 it also gave the exend to which the UN peacekeeping Forces are powered to operate and where not to. this course is so so wonderful for me to start applying some few concepts"
"C’est une formation très exceptionnelle. Ce que j’adore dans le cours, c'est que tu es contraint de tout lire le contenu avant de passer à l’examen final." "A very great intro level course, thanks POTI!" "comprehensive and user friendly course." "Le cours est assez detaillé, permettant aux eleves de bien assimiler"
"The course is designed in such a way that is easy to understand without any interpretation or explanation from some one. Am given this 5 star rating scale. Thank you for the knowledge added to me. " "THIS COURSE IS SATISFACTORY AND KNOWLEDGEABLE "
"Je voudrais vous remercier pour ce cours qui constitue un trésor et un guide complet à la compréhension des opérations de maintien de paix.Bonne continuation"
"This course has the best knowledge to apply in a peacekeeping mission." "THE PROGRAMME IS FLEXIBLE AND RICH "
"Ce cours est précis et concis." "It's an Excellent course which enhances my knowledge in the value for Women and Peace keeping around the world." "Another excellent knowledges for the Blue Helmets. Very helpful and easy to understand." "the course is great, the course material is very rich. meanwhile, intelligence department should be added or incorporated into the military or police department." "Not only The way it is dissigned, but also the way thta final test is conducted because you can stop and start exery time you want with out loosing the answers "
"i cant wait to do more courses"
"This is well prepared. It gives enough skills"
"It is very much IMPORTANT to us, who recently wants to go to serve the UN MISSION"
"I found this course is very interesting. I learned many things from this wonderful course. " "It enhance my security intelligent skill"
"curso espectacular! por favor es necesario en lenguaje español. Gracias POTI"
"It was a considerable useful course for an amateur student who want to have a first sight with the UN Peace Operations around the World. The course was easy to understand and enjoyable to read and learn." "Very educative and promote united nation work toward ensuring peace and security internationally"
"The role of the partners special the AU in maintenance the international peace in africa"
"Very helpful in United Nations Peacekeeping Operations Mission"
Submitted by: ORAKWE KENECHUKWU A. "Good detailed information giving a nice overview on UN peacekeeping missions and the UN in general!" "It very details courses and brief. The lessons learned and good practices are not complicated to understand and easy to follow." "THE COURSE HAS COVERED ALL ESSENTIAL PARTS OF PEACEKEEPING ISSUES, UN, HUMAN RIGHTS, OPERATIONAL, RoL AND ADMINISTRATION "
"I really appreciate this course because I strongly believe that could be a milestone for every peacekeeper involved in a UN mission." "thank you supporting me i will work this knowledge to those who is ineed"
"The course is a well structured knowledge on UN Peacekeeping Operations. It is worth it!" "To answer its questions need to be very carefuly"
"Simplicite de comprehension Cours bien explique chapitres cours et syntetiques style simple et comprehensible "
"I would like to extend my gratitudes for such a comprehensive nad incisive course enables us rather well-mannered and dirct involvement to the practical side of the issue." "This is wake up and eye opener for me this has increase my knowledge and wide my horizon with UNpeacekeeping operation, it is my wish to work with UN and rose to position of UN Secretary General, "
"J'ai beaucoup.surtout le contenu et la façon donc les chapitres sont expliqués. Je donne comme notation.Bien.Merci"
"A Well thought out and compiled effort"
"Its clarity and ability to follow through"
"Course booklet was informative and relevant "
"Ce cours est nécessaire car ça nous permettra de mieux faire dans nos différentes missions de maintien de la paix." "A lot of information i didn't know about UN peacekeeping operations yet i always applied for jobs in my countries UN base but with this course, i am so grateful and recommend it to everyone interested in acquiring knowledge of how things are done and run in the UN peacekeeping operations." "cours intéressant et bien détaillé. ce cour m'a permis de comprendre les principes de base d ' un éventuel déploiement ainsi que les orientations. " "it explains clearly each and every step." 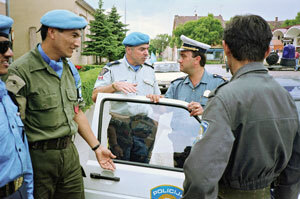 "I learned a great deal about the Un peace keeping operations. The course has covered a wide variety of topics that can be helpful in many ways as I am preparing myself to become a humanitarian. " "Principles and guideline for UN peacekeeping Operations should be the first course to learn for everyone. " "I AM VERY PROUD OF THIS COURSE;IT HAS BEEN OF A GREAT PROFIT FOR ME "
"The course is resourceful and clear. Those intending the work with the UN to pass this as a mandatory"
"The course content was elaborate and educative. TCC and PCC could incorporate this package as part of their pre-deployment training curriculum. " "your courses are excellent.often i recommend them to my ambitious friends. thanks"
"I rated this course 5 star"
"very helpful to improve knowledge "
"I found this course quite informative and helping"
"The clear and unambiguous expression used through out with vivid illustrations"
"So much sacrifice of the part of our peacekeepers and responsibilitype on the Security Council . A big thank you to POTI, I sure have learnt a lot." "les chapitres de ce cours sont tres importants." "It is very useful for a person who will join the UN mission." "IT GAVE ME AN IN-DEPTH KNOWLWDGE OF PRINCIPLES OF THE UN PKOs"
"I liked the way this course ''Principles and Guidelines for UN Peacekeeping Operations'' is presented. There is an accurate succession of ideas that make it easy to understand." "The course made me be aware of a lot of information that i did not have at pre-deployment stage"
"In my life is was keep to undertakes in one among the best Institutions in the world but I did not know where to start through UN training institution offers I prompt in admission and finally my dream was realized"
"This course helped me understand the operating system of the UN mission"
"It has very important materials for the working in the UN peacekeeping operation that one should not miss." "Take this course if you desire to apply for working in UN environment"
"It is very synthetic and can understand very well"
"Excellent course to know about principles and guidelines for UNPKO." "Happy with the course content "
"I found the course very useful and the materials were excellent "
"Je souhaite rejoindre au plus ce boulot. J'ai hâte de ce boulot ! Je remercie tous les membres de nation unies pour ce projet magnifique. Merci beaucoup "
"explanations are so on point.Clear to understand"
"Good review of the topic." "I like the flexibility of the course and the flow of the questions was relatively chronological." "simplicité dans la structure et le style: accessibilité"
"Very useful and comprehensive course." "It gives a sense of understanding when you are a part of peacekeeping operations in term of what you do and not do in order for the mission to be successful. " "A very comprehensive course, must be read by all who are interested in contributing towards peace making, peacekeeping and peace building operations." "The information on UN peace keeping as provided in the course content is comprehensive. 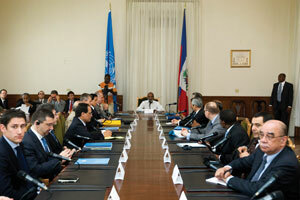 The knowledge so acquired will be beneficial in the undertaking of peacekeeping operations. What a great opportunity to have gone through and successfully completed the course. " "This course provided the basis of knitty-gritty about peacekeeping operations you need to know"
"A very comprehensive course, must be read by all who are interested in contributing towards peace making, peacekeeping and peace building operations. " "This is an excellent course which provides basic knowledge of PKO"
"JE L'AI TROUVE TROP THEORIQUE.CONTRAIREMENT AUX AUTRES IL NE FAIT PAS REFERENCE A DES EXPERIENCES PRECISES.ON GAGNERAIT A Y AJOUTER DES EXPERIENCES PRECISES." "This course is better to all who are appointed to save as peacekeeper." "this course consisting very valubale information that we are applying on UNMISS"
"IT IS A VERY WELL-EXPLAINED AND DETAILED COURSE. VERY RECOMMENDED." "The course is well informed, good for those to be deployed to UN missions"
"THIS COURSE HAS A BROAD KNOWLEDGE WHICH I WOULD LIKE MY FRIEND TO HAVE IT TOO. IT IS AN INTERESTING COURSE AND THIS COURSE IS MORE OF PRACTICAL KNOWLEDGE TO STUDENTS." "It is just a wonderful course. There are no assumptions to any particular question. One simply needs to know it." "The course is very good induction. Questions and answers should be geared to test the understanding." "The course is a very good and comprehensive introduction to peacekeeping operations"
"Wow. This has been such an informative course worth pursueing." "yes it's a very good course." "les missions multi dimensionnelles de maintien de la paix"
"The course give more insight to per-requisite knowledge behind the formation of UN, its objectives and principles and guild-line to be follow on UN mission "
"Very useful, well explained and, overall, great course!" "I like the course very much"
"the detailed presentation of the subject while maintaining its simplicity to undrerstand." "cours très instructifs à lire absolument. Merci mille et une fois"
"Thank you for this interesting course"
"It´s very important to prepare the peacekeepers." "This course is educating course for beginners in peacekeeping operations and programme. " "Videos. Explainings. Questions of exam are clear..."
"Generally i have learnt how peace keepers conduct their operations in accordance with the pricinples and guidlines"
"The course is detailed and covers all facets of Principles & Guidelines of UN Peace Keeping mission." "Very excellent course for reading i got lot of information from this"
"good policy and procedures with historical argument." "Very good skill for life in UN. Mony thank's"
"It was very a good training"
"The UN persons can follow this course and get more knowledge about peacekeeping. its very importance to peacekeepers. " "tous les details relatifs aux principes et orientations du systeme des nations unies ont ete abordes "
"Very interesting and helpful course"
"I would rate this course 5. I found fruitful topics and information regarding how UN works, its principles and mandate." "I liked how it was structured and the way of presenting it." "Very good on-line training, full of valuable information and well organized." "Formidable ce cours pour un eventuelle déploiement en OSP"
"The Materials were direct and concise to points." "experience gained is knowledge shared, the lesson have detailed information"
"During preparation of the course it has been learnt that such courses are valid and every individual should know the functions of United Nations, how United Nations function. It is also every individual to know how much constrains faced by our predesers to attain a high standard and heavily motivated people working with United Nations to keep high the standards as well. " "All the information is very clear and easy to understand!!" "Valuable knowledge gained in this course. This course could be an open window to the members for further peacekeeping missions irrespective of the nationality and force requirement. Thanks to POTI." "i want to complete all of your useful courses and thank you for your efforts&support." "j'ai trouvé le cours sur : principes et orientations des opérations de maintien de la paix des Nations Unies excellent car cela reflète la réalité sur le théâtre d'opération et nous amène à mieux le fonctionnement des institutions de l'ONU le déroulement de ses missions; ses objectifs et sa capacité opérationnelle à conquérir la paix et à stabiliser une paix durable; ce cours nous permet d'ôter les préjugés les mais appréhension par rapport à l'ONU." "This was a very great course. It would be a great aid to anyone with interest working for the UN in order to understand its values and conduct of field missions. Rating 5"
"Excellent course to know more about UN Peace-keeping ops"
"I learned a lot of things that I will strictly need in my future mission. Thank you POTI!" "a very good subject and is very informative"
"I gained knowledge how to peacekeeping and operations, dealing the problems with the host countries in order to solve the worst scenarios like conflict and fight. Now I will be able to work for human right as human being born free "
"It is a nice course regarding basic principles and guidelines for UN PKO"
"I like the UN principles and guidelines for peace operations.I like the terms and policies.I want to share the mission start-up process and the rules of engagement." "Thank you for your prepares this Exam and the test very difficult anyway continue"
"cours bien structuré, clair, qui fournit des informations très interressantes pour un debutant dans les operations de maintien de la paix des Nations Unies." "Pour une culture générale sur les opérations de maintien de la paix"
"A great course that helps you lay a foundation for working with the United Nations." "THIS IMPROVE THE CONFIDENCE OF PEACEKEEPERS"
"Excellent course... I really like it." "Well understandable, all the topics are interested,is one of the best subject on line"
"Muy contento por la terminacion del Course: Principles and Guidelines for UN Peacekeeping Operations en el idioma ingles gracias al POTI y al ESMAI por permitir por medio de medios tecnologicos que tengamos cursos que noc capaciten cada vez mas sobre el mantenimiento de paz de las NN.UU"
"Excellent overview of the UN peacekeeping process." "This course was a useful review for me having previously served on three NATO missions, and as well it was useful in a general review, update and familiarization with UN Peacekeeping operations which i have supported previously in Mine Action. " "The "Principles and Guidelines for UN Peacekeeping Operations is a comprehensive document that defines and promulgates available peacekeeping doctrine, definitions, procedures, and policy. In 10 chapters, it introduces the concept and evolution of UN peacekeeping, explains the decision process that precedes the deployment of a peacekeeping operation, and then the planning process to implement that decision. It discusses the art of successful mandate implementation. It discusses the management of peacekeeping operations, how operations are supported and sustained, and how they are concluded at their termination". I highly recommend it! Thank you"
"this course is a must do by both military and civilian"
"Ce cours décrit bien les politiques et les procédure suivi par le conseil de sécurité. Elle démontre bien l'importance de chaques étapes vers une paix durable. " "The course was informative and assisted me in understanding the reasons and thought processes that goes into deciding when to activate a PKO"
"The course precise a lot of knowledge I had about peace keeping mission. I get also more new subject witch are very important for any peace keeping mission; I mean for exemple, DIH " le droit international humanitaire " and peace keeping preparation process and deployment phases "
"This course is critical,tactical,practical,logical and must learn for all serving UN staff, Non UN staff and anyone that one to go in to peace operation." "what i have liked about this course is that despite being a UN paecekeeper,am not above the law,meaning am not restricted on international humanitarian law should i found with a case to answer in a mission area. " "plus d'échantillons des opérations de maintien de paix"
"It is an important tool for people who needs to prepare for UN missions." "The language used is simple and easy to understand." "The Teaching and Learning process of Principles and Guidelines for UN Peacekeeping Operations is very clear, well understood and effective. " "Le chapitre sur l' évolution , la direction et la gestion des opérations de maintien de la paix des Nations Unies." "It's a good course and it prepares somebody to for a peacekeeping mission.in terms of understanding what UN is." "je suis tres satisfait des cours"
"very informative course. All aspirants must do this course." "THE COURSE IS GOOD ESPECIALLY TO SERVING MILITARY PERSONNEL WHO WISH TO SERVE IN UN MISSIONS"
"The way the course is written made it simple to understand. It presented a clear picture of what PKOs are all about." "It has been a great opportunity to improve professionally as a mediator and to use UN methodology in many different contexts. Highly recommended!" "I LIKE ALL THE TOPICS"
"very clearly, the course is well explained." "This median should be used to every living existing institutions in the world .my regards to every body that coordinate these program." "It was a great opportunity to follow a course like this through online." "The course has builded me in the field of Peace Operations of UNITED Nation. And has re branded my Knowledge. It is really a Nice Course for those who intend serving in a mission. Tho have not started one. But am willing to serve in any with this Knowledge acquired from this training. " "Upon completion, i realise that, the course is technical and challenging too. Why? Because during study, i had to develop a mind image of UN Peacekeeping Operations at the same time trying to put myself in the situation. It has also given me a clue on how the UN Peacekeeping Operations do operate in the field of diverse conflict. Getting to understand that decisions are not just taken but cautiously considered in order to deploy a peacekeeping operation mission." "l'historique des OSP , le brossage succin de l'organisation des missions de maintien de paix"
"The course is quiet educative and wel establish with good background. " "IT IS VERY COMPLETE, CLEAR, UNDERSTANDABLE AND OF MUCH LEARNING"
"You understand, how to operate UN basing on procedure and policy." "It is a good course and very informative and I enjoyed the notes relared to the course." "The material is very precise, which makes it easy to understand. Thanks to the entire team of POTI and the donors who made it possible fro me to do the course exclusively free of charge!!! " "The course is very useful to peacekeeper"
"this is the best course please do it twice "
"The course shows reality how every person have contribution to make the world peace"
"TOUTE CHOSE DEMANDE UNE ORIENTATION, CECI M'A ETAIT TRES UTILE CAR JE SUE LA OU JE VAIS"
"The core business of United Nations peacekeeping operations. Please read about it." "Its the best material to prepare to a UN mission." "La transmission de la Matière était très claire"
"it was fun and precise"
"This is a practical course and useful to refresh knowledge of field staffs. I do recommend this course for any new staff and those interested in UN Job: it is very easy and clear and will help any new comer - even without UN experience to be immediately operational." Submitted by: NTANGA NTITA Jean de Dieu D.
"nice course...just as straight forward as it can be"
"It a very good source of information thank you "
"The course provides a very deep and comprehensive introduction into UN Peacekeeping Operations from the very start of an operation until the actual withdrawal. It really expanded my knowledge and surpassed expectations." "Toutes les thématiques développées sont indispensables, mais j'ai trouvé le cours assez dense. " "This is an excellent course. I am very thankful for the opportunity." "The coverage of the content is comprehensive and easy to grasp." "Very explicit and self explanatory course"
"This course is well professionally and technically, wide explained in details particular in peacekeeping operations, therefore it's very useful to be under gone by any peace keeper before or during operating in the field in order to avoid some doubtful mind in his/her a mission progress." "The detailed first hand information and explanatory charts. " "The course afforded me the opportunity to learn more about UN"
"Ii was very interesting to read about fundamentals for a UN mission deployment." "The course enabled me to achieve my learning objectives. It was very helpful." "yes its good course for un mission "
"This course is excellent for people like me who wants to know much about peacekeeping operations." "Provides a clear knowledge about the United Nations and the advantages of peacekeeping operations.. Excellent to be enrolled "
"learning the mechanics, workings behind a UNmission at different levels was informative"
"PERFECT NOTES AND ILLUSTRATIONS "
"j'ai aimé toutes les questions qui traitent des principes et orientations des opérations de maintien de la paix des nations unies et surtout les questions sur le droit international humanitaire." "the course is very helpful more so if you're going to serve in a peacekeeping operation"
"It is more involving.Most questions needed serious thought because of close relations"
"Great course which gave me a good insight of the UN organisation "
"excellent course, I recommened it "
"the course that I have completed, Its material is good and to read every knowledge to improve to best." "one must study the course in full time before he think of taking the exam"
"Dear fellows it provides the information regarding the UN peacekeeping operations. it is an excellent with 100 out of 100 for the beginners." "Ce cours est très instructif"
"The course was very good because it answered the question why (Peace Keeping) that I had for many years "
"It's good pertaining peace keeping operations"
"The course gives more knowledge on UN operational procedures." "The course content is in-depth and fully illustrated. The chapter quizzes greatly add to a better understanding of the foregone chapter and prepares students for the final exam. " "The course is excellent. As a personnel in the mission area,how important it is to be credible and to know when and how to use the minimum force." "Very good study material I like it"
"todo el material es claro y de excelente calidad, resulta de mucha ayuda para el estudio en particular... juchas gracias"
"Very comprehensive and informative. Highly recommended to those aspiring as peacekeepers in the future. " "The course has explicit learning materials that makes studies so exciting. Am very glad I enrolled on this course. I am a Radio operator in the mission field, and this course, in the chapter on communication has given me deep insights regarding dissemination of informations that assists in maintaining the credibility of a mission." "This course is very useful for all people who want to serve in a peacekeeping operation and those already on board. " "Thank you for this course, it really improved my knowledge related to the presented topic." "This course has broaden my horizon about PKO and its significance in the maintenance of global peace and security." 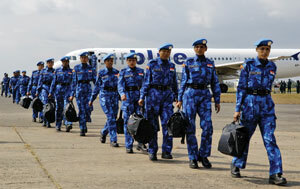 "This course is sufficient and indicates the basic role of the UN peacekeeping operations which is very useful for the officers who joint PK forces or even Staff officers in HQs"
"Principle and Guidelines for UN Peacekeeping Operation is a special and a good course for anyone who have it in mind to participate in UN Peacekeeping Operation. It touches all areas of peacekeeping operations. I am very glad to registere and pass this course. " "The materials are very useful"
"the course is very perfect atleast it makes many peacekeepers to know more about the effort of UN mostly in African continent"
"this is very good course please do it twice"
"i like the fact this course has impacted a lot of knowledge in to me about the things that i use to doubt about as far as peace keeping is concernd"
"EXCELLENT TO HAVE A REAL NEEDED INFORMATION PRE-PARTICIPATING IN UN MISSION"
"Gave me a good overview of the UN Peacekeeping Operations." "The course is very educative." "The Course was an eye opener for me as a person planning to join the UN Peacekeeping Missions Thank you very much POTI Team"
"The ease of reading and the lack of acronyms"
"todo lo relacionado es muy importante el tema me gusto mucho gracias"
"learnt a clearer picture of UN operations." "Un outil essentiel pour un agent voulant travailler au sein du systeme des Nations Unies"
"Excellent pour les personnes engagées dans les missions de paix "
"Le contenu, c'est vraiment instructif." "I enjoyed taking this course so much so that I intend to take many more! I am grateful to you for providing such valuable content for like-minded people who want to make a difference." "VERY WELL WRITTEN. ELABORATE AND COMPREHENSIVE." "CONGRATS THANKS FOR HELPING US TO IMPROVE OUR KNOWLEDGEMENT." "Course is more than useful, get it. " "j ai apprécié la simplicité et la démarche pédagogique avec laquelle les thèmes du cours ont été abordés"
"It is a very nice course since it covers most of the peacekeeping operation principles." "it was understandable I rate it I can use it during my deployment. I rate it a 4"
"Excelente curso, muy intuitivo, acorde a las exigencias que impone una Misión." "through the course i was able to learn more about UN mission and have a clear picture of its mandate. " "This course has enabled me to understand how U.N operates and by understanding this i would recommend many people to do the course by doing so we get the information that is useful for us to become agent of peace wherever we are"
"Excellent course It has a wide range of topics and knowledge." "It improves my quality and ability to do good job"
"complete and interesting !! " "Is a really helpful course to learn the basic principles of the humanitarian law and the UN procedures." 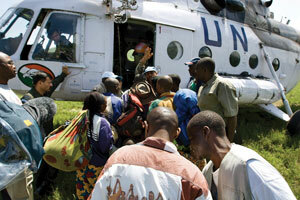 "Over the past six decades, United Nations peacekeeping has evolved into a complex, global undertaking. During this time, the conduct of United Nations peacekeeping operations has been guided by a largely unwritten body of principles and informed by the experiences of the many thousands of men and women who have served in the more than 60 operations launched since 1948. This document captures these experiences for the benefit and guidance of planners and practitioners of United Nations peacekeeping operations." "Was really informative and builds ones ego to serve in the Mission"
"the materials and the course content are very interesting." "This course can provide principles and guidelines for UN peacekeeping operations and assist who have to serve on the mission next future." "An excellent source of information for anyone planning on deploying as part of a UN PSO/PKO." "COURS TRÈS BIEN ÉLABORÉ "
"The course material were very clear and elaborate." "I learned more things through this course! " "The entire course in very informative and intuitive"
"Very excellent course for peace keepers"
"The course would give you an understanding of UN Peacekeeping operation"
"THE COURSE IS MUCH EDUCATIVE"
"HOW THE UNITED NATIONS PEACE KEEPERS ARE GENERATED, WORKING FRAMEWORK ON GROUND, ROE,DUF,"
"Very good with excellent content "
"Cour tres interressant qui vous donne tous les principes des UN. Merci à l'auteur." "An excellent course, wide and comprehensive, that helps to understand the basic principles and activities to deploy a UN Mission in the field"
"good for soldiers going for their first peace keeping tour"
"Was tougher than expected. " 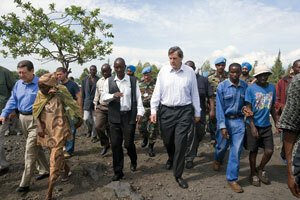 "It provide more knowledge concern the peacekeeping issues and its more helpful for all component at the mission area." "I liked of method of study and end-of-lesson quiz." "The course helped me to gain more interest in studying different types of UN materials and get a broad understanding of the UN peacekeeping concept. Due to most challenging questions i encountered in the exam, i was forced to research more so that i could get what exactly the United Nations peacekeeping operation is all about. It has been a fantastic experience." "Le cours offre un large panel d'informations très utiles pour la compréhension des interconnexions entre les différentes tâches et missions dévolues au système des Nations Unies "
"I found some question which are nor related to course pdf and those topics I search inside internet, please include all topics inside pdf"
"This course is excellent for those are going to the mission!" "thanks ,very useful course "
"The course has widen my view on principles of operations "
"I liked absolutely everything in this course. The videos, chapters, additional readings were interesting and understandable. Thank you very much for such a super opportunity to learn about this subject!" "This is a really good course to help me prepare myself for joining the mission in the future and also learn more about the structure of UN and how PKO works." "Very useful for the UN peacekeepers to be deployed in UN missions"
"It very helpful during the Peacekeeping Operations "
"Course is very useful for the personnel to be deployed in UN Peacekeeping Missions under various Capacities"
"These principles and guidelines can be used in the field missions." "the course is very resourceful and of great relevancy in understanding the mission dynamics especially the involvement of multidisciplinary staff in a hybrid peacekeeping operation.the has clear objective analysis by the wealthy knowledgeable author"
"ce cours est bien conçu et détaillé pour des futurs missionnaires des nations unies.il est vraiment comme je l'ai dit instructifs." "j'ai beaucoup aimé les photos d'illustration et la simplification de cours, facile à comprendre!!!" "The course is generally good it help when working with the groups of people who are in problems. Specially this types of courses should be open in south sudan to change the mind of war to peace." "the course provided me a comprehensive knowledge regarding the principles of peace operations." "I learned basic knowledge in a PSO mission." "I rate this course in my preparation as very valuable." "the questions are spread across all corners of the material. very educative, instructive and upon it all, value-added"
"It is an interesting and educative course"
"Durant cette étude avec l'institut, j’ai compris les enjeux et défis relatifs aux opérations de maintiens de la paix des Nations mais aussi à la prise en compte des aspects transversaux dans une opération de maintiens de la paix multidimensionnelle des Nations Unies . J’ai été convaincu que le travail auquel les Nations Unies à travers ses organes s’attèlent quotidiennement est vaste, méticuleux et sensible. Le chemin qui reste à parcourir pour qu’il y ait respect des droits de l’homme de tous par tous, et pour qu’il ait une véritable égalité entre tous est encore long. Seuls une réelle volonté politique des Etats et un engagement de tous les acteurs nationaux et internationaux, sans réserve aucune, permettront de raccourcir ce chemin. Un véritable travail de conquête et de préservation des droits de l’homme doit être entrepris par tous les acteurs. Comme affirmait un auteur « La liberté est innée, mais il faut la conquérir ». " "All topics are excellent and very useful." "COURSE IS USEFUL IF YOU ARE WORKING AS A PEACEKEEPER"
"Very good introduction to the peace operations field, but I must say the course lacks of in depth analysis. " "Il y a une mission de maintien de la paix en Côte d'Ivoire et au fur et à mesure que j'apprends sur les opérations de maintien de la paix, je comprends mieux le rôle joué par les Nations Unies depuis 2002." "Principles and Guidelines of UN Peacekeeping Operations, I can now tell the normative frameworks for UN Peacekeeping Operations and the function the Security Council plays in setting mandates for UN Peacekeeping Missions, all thanks to POTI"
"This is an excellent learning lessons for a peacekeeper before the deployment in the mission area." "ITS A VERY INTERESTING AND QUITE INFORMING COURSE"
"I recommend others to take up this courses thanks to poti"
"this course is very important for al un military personel"
"clear and well illustrated to the points"
"IT IS AN EXCELLENT GUIDE "
"J'ai beaucoup aimé la façon dont le cours est présenter avec des images et surtout des mini test après chaque leçon.les différents sujets abordés sont accessible "
"It's very interesting even for people who have done previuos missions." "what i like is that, it teaches how to work on the implementation of peace process"
"I acquired a lot of information necessary for my career. Thank you!" "In depth knowledge of UN ways fo working." "I like the how the course is structured. It is not too long to become boring and not too short to don't understand some concepts." "The course was well structured and interesting"
"The course was very detailed and informative." "Very nice course available to everybody. It offers a unique opportunity to get knowledge about basic principles for UN System." "The contents are minutely all in detail." "didn't know any of this thing. very helpful for future and present,knowing about laws and organizations working for humans in almost all aspects of life." "Principles and Guidelines for UN Peacekeeping Operations COURSE VERY AMAZING,IT EQUIPS YOU WITH MAXIMUM AND NECESSARY KNOWLEDGE AND SKILLS , I HAVE LOVED AND ENJOYED IT.I AGAIN CALL EVERY BODY TO ATTEND FOR THE COURSE. I LOVE POTI WITH ALL MY PASSION.KEEP IT UP POTI"
"I recommends that all intending peace keeper and those that are serving presently on Mission field to sit for this course. It's good." "The course is a very good introduction to the subject." "General and useful compact information"
"Je trouve que toutes les parties du cours sont intéressantes dans la mesure nous voyons des Missions des Nations Unies qui sont déployées dans le Monde. Il est important de savoir les principes qui les guident et leur planification." "It teaches me with new knowledge that i don't have have before and it has now prepared and equipped me with an extreme knowledge of why UN and its Peacekeeping missions are important." "It was clearly outlining the consequence of incredibility.That is to say once lost its not easy to regain." "This course is very interesting and it is able to teach a lot in few time to a persone..."
"VERY GOOD KEEP IT UP"
"The course enlightened me on the process of setting up a mission and all the relevant departments which make the UN a system." "Cours explicite, précis et enrichissant." "Very educative and offers the necessary tools for anyone wishing to work in a peacekeeping operation with well outlined principles and guidelines." 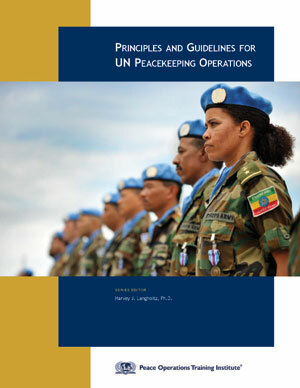 "It explains the Principles and Guidelines for UN Peacekeeping Operations clearly"
"Excellent. as a member of Peace movement "
"the course help peacekeepers to have wider knowledge of core principles guiding their operations "
"I got to know a lot of facts about UN peacekeeping operations. Got clear understanding of main goals of UN peacekeeping and building meanings. Thank you for a wonderful course! " "Its educative and a guide to all students of International affairs, it tells what diplomatic mission is all about." "quiet good for a new student of UN POTI to know these things"
"Very educative, especially for an intending peacekeeper!" "IT WAS VERY DYNAMIC AS LESSON"
"Clear explanation. I love the video, and the handbook is useful. Thankyou." "The course was user-friendly. It provided me with the knowledge of new set-up of peace-keeping operations, i.e. Multi-dimensional Peace-Keeping Operation." "The course were well structure ,clear,and with somes picture showing the really situation of a mission on ground"
" un très bon cours." "J'ai beaucoup apprécié tous les enseignements ainsi que les graphiques et les photos...Merci"
"Ce cours a donné une introduction généarle à presque tous les aspects du domaine; je dirai d'ailleurs un momento. félicitation à l'auteur. Merci"
"“Excellent” My appreciation to POTI for giving me the opportunity to enhance more my knowledge and capabilities through this course. I gained a lot of knowledge that would be of much help in my job in the field. With that I will be forever grateful. " "Avec un contenu clair, image et pratique , j'ai trouve sincerement ce cours tres excellement ." "c'est un cours dynamique et plein d'illustrations qui m'a beaucoup entraîné dans la lecture et la recherche"
"It has helped me to gain knowledge while serving in the United nations"
"Very usefull material and course that is very linked to my previous one at POTI, helping me to continue understanding the UN System and partners. Thanks for the oportunity and i will continue studying." "The details about planning, deploying and managing a UN Peacekeeping Mission "
"PEACEKEEPING OPERATIONS AND STAGES OF MISSION "
"The course is an excellent introduction to UN Peacekeeping Operations. It gives the participant a tour of the UN DPKO." "It was a very informative course and I can use the information I learned towards future PKO missions." "I really appreciate this course because , it help me take life more serious , and use my intelligent at a max level. By me growing I to a grown woman this course help me be on the same page of how other Countries view my Country existence . By putting everything else to the side to fully focus you molded me to believe in myself . " "j'ai surtout aimé la disponibilité des informations que nous n'avons pas souvent la chance d'avoir. Comme si je vivais déjà l'action sur le terrain avec des explications claires." "I appreciated the clarity in every chapter, the images associated with the subject and also the explanation for each new term, domain or principle. I was useful indeed." "cours tres claire et riche." "This an overly educative and informative compendium on UN's peacekeeping operations in the field as it concerns the arts and sciences of the game - the latter maybe relative." "Study material was easy to use"
"The course was extremely helpful as I never new what is expected in relation to the practicality of UN activities. It would not have been possible for me to do this course if I had not researched, thus it is advised that courses of this nature be more broadly advertised in public areas to gain more interest. " "Easy to understand and very useful course"
"Excellent for providing all necessary basic knowledge about UN. A must for a Military Observer..."
"It is interesting and very helpful course"
"Quite an interesting experience for me." "4 étoiles. Le a répondue à plusieurs de mes questions sur les soldats de la paix et les interventions des missions de paix." "The course is beneficial both to the military and civilian personnel on mission or intending to serve in PKO." "good way to gain information on un "
"les principes sont bien définis mais les populations locales les ignorent; il faut les vulgariser davantage;"
"Très bon cours pour le succès d’une mission"
"The course provided me a comprehensive insight and knowledge about Principles and Guidelines of Peacekeeping Operations. I now discuss various topics with colleagues from an informed point of view. I conducted an in-house training for my colleagues on the topic "Peacekeeping and Peace-building""
"The provides fundamental information especially for those serving or preparing to serve in UN PKOs. It excellently covered all areas especially in Field operations." "IT'S A VERY GOOD COURSE, FULLY RECOMENDED"
"a great course indeed, all commendation for POTI for imparting such a wonderful training." "it has prepared me to do do other courses"
"I REALIZED THAT THIS IS THE GOOD FOR FURTHER SECURE CARRIER "
"This course provide excellent information "
"I would like to encourage the equitable access to resources for all the students to ensure full participation and in order to provide with a better result. Whish all the team a good luck." "I like the knowledge aquired from the course and wish to suggest that POTI certificates should help us (students) by recommending us to any peacekeeping agencies like ECOWAS, UN, AU for employment to help us put the knowledge aquired into practical use on the field please"
"Implementation is the major key focus to all achievements.really this course has been educative and light therefore, i request that should be extended to universities and high schools curriculum internationally. this will help in bring in awareness and fight for ignorance.......people's rights are abuse because of ignorance.........thanks for the light future." "This course is like a pi-voter as it cut across all the rules and guiding principles in the Era of conflict prevention and the maintenance of lasting International peace and Security. It is a key course to be taken by all who develop interest in UN activities as far as maintenance of sustainable peace and security is concern . " "The course is educative and helpful not only in military section but to every human being. I wish I am free and have money would continue with these courses up to a degree level so that I can also be a teacher to others do I can educate the local population with this knowledge I have acquired from this course. Thank you and God bless." "I was a great experience. I think the course is execellent structured and delivers a very comprehensive set of knowledge in a professional and effective way. Congratulations!" "I like principle and guidelines for any person who serve in the mission." "I think this course provides an excellent understanding of the how and why the UN deploys missions." "Very Usefull for the learning procces." "J AIME LE COURS PARCEQUE TOUT EST TRÉS CLAIRE POUR BIEN COMPRENDRE et LES PHOTOS SONT DE GRAND QUALITÉ." "The course is very interesting, and my knowledge about peace operation is now improved." "Very interesting to know about the DPKO doctrine." "Excellent concise information of Peacekeeping Operations, "
"Very good material, concepts were well explained. Easy vocabuary to understand and clear definitions." "very interesting course, so This course is applicable in real peacekeeping operations"
"the course was really educating. it helps me to learn a lot." "Ce cours offre pour un débutant une vue d'ensemble du système des Nations Unies et surtout sur son orientation de maintien de la paix internationale"
"i would like to thnks peaceoperation training institute ,giving us to this expensive opportunity,,i got this course a lot of benefit,thnks"
"This course is very helpful to learn about international body, and hope it will be continue with more enthusiasm and more new fundamental to ensure peace and security of the World. " "An excellent course which broadened my knowledge about UN and PKOs. " "Clarity and concepts up to date in peacekeeping missions nowadays "
"This course is highly valuable." "This course is wonderful way of learning more about United nation. " "THE COURSE IS VERY HELPFUL FOR PEOPLE WORKING IN PEACE OPERATIONS AND THOSE INTENDING TO WORK FOR PEACE OPERATIONS IN FUTURE"
"it gave me a clear understanding and valuable information of the UN Peace Keeping Operations"
"very good course,easy processing and knowledgeable course." "Plenty of information, very well delivered. The language was very clear with no ambiguous terms. Once again, congratulations!" "The test quizzes were so helpful. They made me internalize the content extensively." "Le cours est bien structuré et détaillé. " "le cours est bien rédigé car contenant moins de fautes. De même son contenu est bien expliqué. C'est un excellent cours." "I really enjoy the part of the examination that requires taking a real knowledge and effective understanding of the course"
"THE COURSE IS RELEVANT TO PEACE KEEPING MISSIONS"
"Qu'avez vous aimé concernant ce cours? Veuillez soumettre le commentaire que vous souhaitez partager concernant ce cours. Le cours est bien strucutré avec des references à d'autres documents pour le completer. Le contenu est consistant." "its very very informative and educative." "The accuracy in which explains its contents. Perfect course for a perfect apprentissage because it has been prepared with basic facts. " "HISTORY OF COLD WAR AND THE GENESIS "
"Este curso me ayudo a incrementar mis conocimientos relacionados a las operaciones de paz"
"IT IS DETAILED, I LEARNT MORE AND INTERESTING NEW LESSONS IN PEACEKEEPING MISSION." "I like this course because you will get kownledge of peacekeeping and UN related activist"
"it has enlightened about UN peacekeeping operhations." 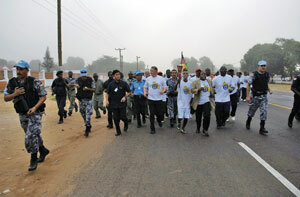 "The course is an extra mile to go for UN peacekeeping staff." "This is a must read for all UN personnel serving in a peacekeeping ops. It must be made as a compulsory test subject for all. " "Learn so much in this course and it helps me a lot . " "THE COURSE IS VERY INTUITIVE AND IT IS AN EYE OPENER." "The handbook Principles and Guidelines for UN Peacekeeping Operations is perfect for the course." "Free access to these excellent courses was the best part for me. thank you." "The Precise nature of the questions is very encouraging to the student. " "I experiences a lot from this course and i request all of us to change the world to a better environment in which there is peace,justice and harmony "
"I am happy I enrolled for this course. God bless my teachers"
" Please provide any additional details about the course that you wish to share.The Course also enriches peacekeepers with various knowlegde ranging from basic principles,human rights,humanitarian law,mine action and the phases of deployment and the way the deployment is conducted." "I have to say thank you for this opportunity. I have learned a lot. Ready to be Deployed! " "Thank you very much! It was very interesting and useful for me." "The course is an eye opener. " "It is an interesting course that does not only provide guidelines for peacekeeping but means of fostering peace and unity anywhere"
"What a nice course! serving in a mission requires one to clearly understand key players, roles, their tasks and the mandent to defend." "It has an enriching material especially in matters regarding traditional ethics and cultural issues that are often neglected ." "Une belle initiative à soutenir car ca permet le renforcement des capacités des agents des Nations Unies qui servent sur terrain et aident ceux qui sont ou seront appelés a service sur terrain. ces différents cours permettent d'avoir constamment en mémoire des outils nécessaires pour un travail bien accompli dans les règles d'impartialité et de neutralité qui fournissent de la crédibilité des différentes interventions des Nations Unies dans sa mission de maintien de la Paix. NB/ Notre souhait est de voir une validation des cours de POTI comme des certificats ou diplôme des Nations unies en matière du maintien de la Paix"
"One can achieve a high score without studying - just finding answers in pdf"
"I FOUND THE COURSE TO BE VERY INTRESTING AND EASY TO FOLLOW." "I liked the content of the course? I have no additional comments." "J’ai bien aimé que le cours comporte un glossaire et une large partie sur les droits de l’homme, le droit humanitaire international. " "gives a clear perspective about peacekeeping"
"I rate this course excellent. The understanding that i learned to the capstone doctrine "Principles and Guidelines for Peacekeeping Operations" is very clear and specifically discussed, i learned a lot. I've been deployed in peacekeeping mission twice as contingent member and a military staff, it really added my foundation on peacekeeping. I encourage everyone to tale the course." "Online POTI Course is very useful for a person who is serving or want to serve in peace keeping mission of United Nations." "What could be more divine than sparing time outside one's own peaceful and sufficient life to participate in helping other people who live in fear, violence, and pain journey to/back to peace and prosperity? This is my one last wish on earth!" "The convenience of studying and ease of registering and administering the exam." "Any one who wants to join UN Mission or serving as a peacekeeper"
"I liked the simple, detailed and extremely informative nature of the course.It gives one an insight to the delicate nature of Peacekeeping and the machinations of the UN to arrive at that decision. Highly Recommend." "I liked very thing in the course"
"Qu'avez vous aimé concernant ce cours? Veuillez soumettre le commentaire que vous souhaitez partager concernant ce cours. j'ai beaucoup appris et je veux apprendre davantage, ce fut pour moi une belle découverte. Et je veux continuer"
"Its if any who will attend this course to get a job in UN." "j'ai trop aimé ce cours car il m'a appris les principes des opérations de maintien de la paix qui me guideront quand je travaillerai pour les Nations Unies." "The course was so elaborate and educative." "This is a very important course especially to an individual who is deployed or expecting to be deployed in UN Peacekeeping missions since it acts as an orientation course as regards to principles and guidelines for UN PKO." " the course is very informative. it helps a field operative to understand guiding principles of un work." "L'importance de la mission de maintien de la paix. Et le rôle que joue chaque acteur dans le processus de maintien de la paix." "The course was excelent in understanding the principles and role of UN Peace Keeping Operations. " "It is informative and interesting from introduction to the last page"
"the course is very interesting and explanatory.and beside it gives so much knowledge of which i was ignorant"
"In was an excellent course." "It puts students on UN directives. Let more guidelines be added." "I learn about the definition of peace keeping, procedures and policies to follow. These are the most important aspects in this course and I would recommend as excellent. " "It was very informative.and I learned a lot"
"THIS COURSE HAS GIVEN ME AN OPPORTUNITY. TO LEARN MORE ABOUT UNITED NATION AND ITS OPERATION AND AS A SOLDIER THE COURSE HAD GIVEN ME HOPE TO SERVE UNITED NATION BETTER IF THE OPPORTUNITY IS GIVING TO ME AGAIN." " The course was very clair and undestable . Thank you." "J'ai trouvé bien l'explication des certains phénomène, la pédagogie utilisée en somme"
"sur le plan didactique et pédagogique ce cour m'a permis de mieux m'orienter non seulement sur ma formation personnelle mais également de mieux cerner les contours et les rouages de maintien de la paix.tout compte fait je sais savoir raison garder .car ce qui s'énoncent clairement se donne aisément et les techniques ou approches se donnent justement.dans ce contexte vous atteindrez je crois toujours vos objectifs;celui de voir beaucoup de certifiés merci"
" Learning is a journey that never ends.... in this there is nothing about it to miss because it gives you an insight into the marrow of the functioning of the United Nations and Non-United Nations bodies. i learned in this many ways by which conflicts at any level could be resolved without any use of force. finally from it i came to understand that even at hostile moments and situations, dialogue remains the most vital methodology applied to solve problems because it has attached strings of understanding and taking into consideration values and well being of man and the environment.... "
"The programme structure is on point and course materials are explicit." "Ce cour est complet. Il traite de tous les sujets liés à une opération de maintien de la paix depuis la prise de décision jusqu'à la clôture de l'opération." "It was informational and covered all aspect of the United Nations System. " "The course it is very useful and I receve many new words and meaning I encuredge every body to take this course." "Qu'avez vous aimé concernant ce cours? Veuillez soumettre le commentaire que vous souhaitez partager concernant ce cours. Ce cours est d'une importance capitale. Il m'a permis de connaitre, en plus de l'historique et la planification des opérations de maintien de la paix des Nations Unies, l'art de la mise en œuvre réussie d'un mandat "
"j'ai eu l' occasion de comprendre encore plus le cours sur l' introduction au système des nations unies . donc j'ai amélioré la compréhension de ce cours .ma note pour ce cours a été meilleure"
"The course is interesting and challenging, i recommed it to all my friends and well wishes. Thank you." " my view is that this course is very interesting so I hope it must be available for all staff members so as to get the goog advantages . also this course information will help the UN operations to carry out the mandates . so I need such courses like this course for more self development . " "The course is interesting and challenging"
"The course is interesting, challenging." "In fact the course is very impressive. My regards to POTI management team." "the course is very interesting how UN engage in the conflict are and manege the broad range of problem"
"Very good, intensive and an insight into the UN operations but it it takes a whole lot of one's time to complete each course." "Good course. very educational and indepth training knowledge for future PKF "
"knowing more about the frame work of the united nations"
"i like this course and no additionals details"
"how to staer next course that is Implementation of security Council "
"the course is very exciting and fanatastic"
"the course is challenging and tasking"
"THE COURSE IS VERY INTERESTING AND EXCITING"
"I liked too much the course, that's why I am very happy with this. For mi this part is very complex, I think that is necessary the improve the audio separately for this part and for each course which your giving. " "THE COURSE IS LOGICALLY SET THUS EASY TO UNDERSTAND. HOWEVER, WHAT IS NOT CLEAR IS HOW CONSENT FROM THE WARRING PARTIES REQUIRED FOR PEACEKEEPING IS SUSTAINED IN SITUATIONS WHERE THE ORIGINAL PARTIES TO A CONFLICT HAVE TRANFORMED, CHANGED OR NONEXISTING. 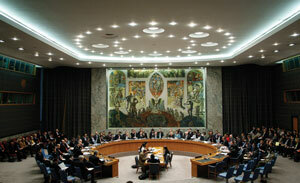 INCASE WHERE NEW ACTORS EMERGE, DOES UN OBTAIN NEW CONSENT? INCASE ONE OF THE CONSENT PARTIES IS THE GOVT. AND IT HAS CHANGED/ REPLACED, IS CONSENT TRANSFERED?" "the course is wonderful and challenging"
"What 4 Stars = Gooddid you like about the course? Please provide any additional details about the course that you wish to share." "Excellent course. Very well structured." "an excellent course to get started and get an insight in the UN"
"The course provided me with a first sight knowledge on peacekeeping and the desire to study more of such courses." "I want to know about briefly the description of peacekeeping mission." "It gives basic knowledge about UN for those who are already working with United Nation but much beneficial for outsiders." "This professional course is really increased my knowledge about UN Peacekeeping Operations & i suggest my friends and whole the world to participate in Peacekeeping mission by their own resources all that means. Very warm wishes. Regards, Muhammad Yousaf "
"I am proud to learn this course.Thank you "
"C'est un cours très intéressant pour ceux que vont participer d'une mission à l'egard des Nations Unies." "IS VERY CLEARLY EXPLAINED AND HELPFUL "
"I wish to work with UN peacekeepers"
"Good course- gives overview of UN peacekeeping operations in a clear way. Gives the student a great foundation of knowledge on the goals of UNPKOs." "I like everything about elap and particularly the UN adn their peace initiatives globally, please of what relevance could this certificate be after reading somany of the course. The motives behind is that I intend to finish all the available courses within a specific time frame and thereafter. can i use same to apply for UN jobs, because in my country, corruption would not allow the certificates to be relevant as the cae may be "
" This course has been developed in consultation with the Peacekeeping Best Practices Section of the UN Department of Peacekeeping Operations’ Policy, Evaluation and Training Division. It is based on the internal DPKO/DFS publication entitled United Nations Peacekeeping Operations: Principles and Guidelines, which is more widely known under its informal name Capstone Doctrine. "